East China is the new economic center of the country. Hangzhou (Zhejiang Province), former capital with a famous lake, one of China's top destinations for domestic tourists. Marco Polo wrote of Hangzhou the city is beyond dispute the finest and the noblest in the world. Suzhou (Jiangsu Province), old city of canals and gardens, now a major center for high tech. The Chinese have a saying that heaven has paradise but Earth has Hangzhou and Suzhou. Originally, Hangzhou and Nanjing were the great cities of this region; both have been the capital of China. Suzhou was another important city, famous for its gardens, canals and silk. It was the capital of the Kingdom of Wu at a time when China was divided. In the 19th century, after one of the Opium Wars, China was forced to open certain Treaty Ports to foreign trade. The two in this region were Ningbo, which until then had been mainly the port for Hangzhou, and Shanghai, until then an insignificant town strategically positioned near the mouth of the Yangtze. Both developed rapidly after that. By the early 20th century, Shanghai became one of the world's richest and wildest cities. Then everything went wrong; this region was one of the areas of China that Japan succeeded in conquering, and they suffered horrendously (especially Nanjing) under Japanese rule, 1937 to 1945. Then there were the Chinese Civil War, 1945-1949, the Great Leap Forward in the 50s, and the Cultural Revolution 1966-1976; all caused additional problems in this area. In the "reform and opening up" since 1978, this area has benefited enormously. Shanghai is again definitely one of the world's greatest cities; Hangzhou, Suzhou and Nanjing are not far behind. All are very modern cities with lots of large new buildings, more under construction, and subway systems either in service or under construction. The entire region is a hive of industry, one of the most prosperous in China. It is a magnet for migrants from poorer regions who come here in droves seeking work. As anywhere in China, Mandarin is the lingua franca; nearly everyone can speak it except some of the elderly. As elsewhere in China, English is not widespread but some people speak it quite well. The region does have its own language group, called Wu. This is a populous region and the number of Wu native speakers is large; at 78 million it is rather more than French or Italian. The language is also referred to as Shanghai dialect or Shanghainese, though that is not strictly accurate. 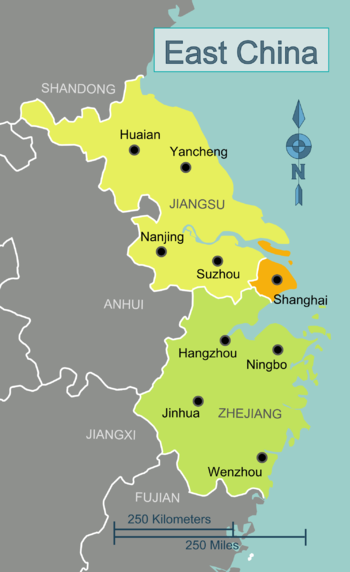 There are local variants of Wu; the prestige dialect is that of Suzhou (an older city, capital of the Kingdom of Wu centuries back, and home to many scholars), not that of Shanghai. Wu is spoken over quite a broad area, including Shanghai, most of Zhejiang, parts of Jiangsu and even a few places in Anhui. Dialects of Mandarin are spoken natively in northern Jiangsu, such as the area around Nanjing. Perhaps the commonest way to reach the area is to fly to Shanghai. There are two airports. Pudong is a major international airport with connections all over the world; Hong Qiao handles mainly domestic flights. Busses connect the two, taking about an hour. There are also direct busses from Pudong airport to major cities in the region; see city articles for details. Recently, subway line 2 (the main East-West line through downtown) has been extended; it now goes to both airports and to the new Hong Qiao train station right next to Hong Qiao airport, which has high-speed trains to many places in the region and beyond. Other cities in the region, such as Hangzhou and Nanjing also have international airports. Air Asia's ] flight from Kuala Lumpur to Hangzhou provides a low-cost route to or from Southeast Asia. The area is also well connected via China's road and rail networks, and there is a Suzhou-Japan ferry. The area is well-connected by China's rail and road networks. There are good highways and a high-speed rail network. It is also possible to travel by boat, see Along the Yangtze River or Along the Grand Canal. Along the Yangtze River and Along the Grand Canal both cover some routes in this area; both also extend beyond it. Shanghai for the first-timer covers one city in the region. This page was last edited on 3 April 2018, at 21:16.